Grain-free never tasted better! My easy and super moist Paleo chocolate fudge cupcakes will satisfy your chocolate cake cravings. Made with simple and healthy ingredients. Gluten-free, dairy-free, grain-free and no refined sugar. Yes, even the glorious chocolate fudge frosting! Yesterday was my husband’s birthday, and I wanted to bake him something special. He is trying to stay away from grains and dairy because of migraines and autoimmune inflammation, so I needed to find a Paleo cupcake recipe. After doing a search for Paleo cupcakes on Pinterest and not quite finding what I was looking for, I decided that I would try to make my favorite cupcake recipe grain-free. I have something to admit friends, that grain-free baking is a whole new world for me. I was a little nervous about stretching outside of my normal gluten-free baking comfort zone, but these fudgy beauties turned out awesome! Most gluten-free flours that I use are made with rice flour. Rice flour mimics the taste and light texture that a wheat flour would produce. Grain-free flours, like coconut and almond flour, do not have the same texture or flavor. They produce a denser, heavier cake. Also, you can taste the light nutty flavor of the coconut and almond flour. So here is my disclaimer friend, if you have never had grain-free cake or cookies, it will be a lot different in texture and flavor than what you are used to. It is not a bad different, but your cakes and cookies will be heavier and denser. Now that I have given you the grain-free disclaimer, let’s talk about dairy-free and no refined sugar baking. Once again not having dairy or refined sugar in your baking recipe will change the texture and flavor. I promise friends, although it’s different, it’s a tasty different. I substituted coconut oil for butter and honey and pure maple syrup for sugar. 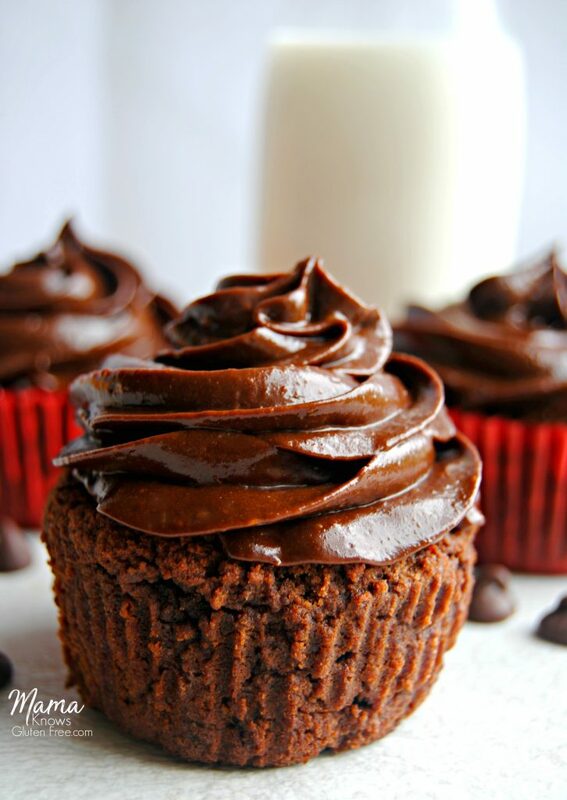 My Paleo chocolate fudge cupcakes are super moist and super rich. Packed full of the chocolate fudge flavor you crave. Now let’s talk about the fudge frosting. Honestly, this was the hardest part of the recipe for me. A frosting made with no butter and no sugar was hard for me to imagine. Most Paleo recipes call for coconut cream or palm shortening, which I did not have. One recipe that I found used avocados. Yes, you heard me right, avocados! I always have avocados in my kitchen, so I thought I would give it a try. I adapted the recipe because our family likes things on the sweeter side. I was so surprised how glorious the fudge frosting turned out! My kids were super skeptical at first, but once they tried it, they said it tasted like real frosting and they could not taste the avocado at all. Pro Tip: When I pipe frosting onto cupcakes I use a trick where I line a large cup with the piping bag. It makes the process much less messy! My favorite frosting tip is the Wilton 1M. So what did my hubby think? He ate one as soon as he walked in the door! Oh, and then he had another one right after dinner. So I would say that my new adventure into grain-free baking was a success. If you are needing to make a change to the Paleo diet or a grain-free diet for health reasons or just want to try a new type of gluten-free baking, I promise my recipe for Paleo chocolate fudge cupcakes will not disappoint you. Looking for Paleo recipes? Take a look at these gluten-free and Paleo recipes. Frosting recipe adapted from Hold the Grain. 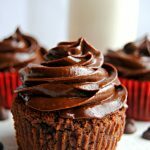 My easy and super moist Paleo chocolate fudge cupcakes will satisfy your chocolate cake cravings. Made with simple and healthy ingredients. Gluten-free, dairy-free, grain-free and no refined sugar. Yes, even the glorious chocolate fudge frosting! Combine flours, baking soda, salt and cinnamon in a large mixing bowl. In a small pan melt the coconut oil. Add the cocoa powder and water and stir until all the ingredients are combined. Pour the hot oil mixture into the dry mixture and mix together on low speed, either with a stand-up mixer or hand mixer. Add the eggs, applesauce, pure vanilla extract and honey to the batter and mix until fully combined. Add the batter to lined cupcake pans. The batter will be thick and sticky. Fill the cupcake cups all the way to the top. If you are not using baking cups, spray cupcake pans with cooking spray. Bake for 20-25 minutes. Watch the cupcakes, because all ovens are different. Place a toothpick in the center of a cupcake to see if it fully cooked. Store in an airtight container. (These are even better the second day!) Frost the cupcakes as you eat them. Place remaining frosting in the refrigerator. Add the all of the ingredients into a food processor or blender. Blend until completely smooth. Chill the frosting in the fridge until ready to use. If you are going to pipe the frosting on the cupcakes (like I did) put the frosting in the piping bag and place in the freezer so it can firm up a bit. If you are not piping the frosting, frost the cupcakes as you eat them. Place remaining frosting in the refrigerator. Store in an air-tight container. Frost the cupcakes as you eat them. Place remaining frosting in the refrigerator. Hi Audrey, thanks for the recipe! I eat “clean” which for me means no sugar, regular wheat or anything artificial. I’ll be making this with agave nectar as the only sweetener and i was wondering if anyone else has tried that? I may also try spouted whole wheat or spelt as sub for part of the almond flour if you have any recommendations about that. Hi Kathleen! Can you have rice flour? If you use gluten-free rice flour it’s not longer Paleo, because rice is a grain. I make cupcakes with gluten-free rice flour all of the time (I like Pillsbury gluten-free flour). If you are going to do gluten-free rice flour I would leave out the coconut flour. If the gluten-free rice flour does not have xanthan gum add 1/2 teaspoon to the recipe. If I were to use Pillsbury gluten free all purpose flour, and leave out coconut flour, how much should I use? Hi Shannon! I have never tried this recipe with the Pillsbury gluten-free flour. I would think that you could substitute 2 cups of the Pillsbury gluten-free flour and if you were to want to still use the almond flour I would use 1 1/2 cups of the Pillsbury gluten-free and 1/2 cup of the almond flour. I’m not sure how they will turn out because I have never tried this recipe with a rice flour blend. Can this recipe be made egg free? We have an egg allergy in our family. Hi Rebecca! I’m not sure I’ve never tried. You could either add more applesauce or an egg replacer. Please let me know if you try it and how it turns out egg free. Thanks! Please send a few my way! Those look so chocolaty!! You got it Sandi! They are super chocolaty! Wow! These cupcakes are so delicious 😄such a great grain free recipe. We love chocolate and these are perfect! I love the frosting, its so creamy and definitely made the cupcake a wonderful treat. Can you remind/recommend how to keep the cupcskes fresh and what ius the shelf life? Thank you for sharing! It’s a great recipe. Thank you so much! I am so glad that you enjoyed the cupcakes Chenda. To keep the cupcakes fresher longer you can add 1/8 teaspoon of ground ginger to the batter. I always keep them in an airtight container. I’m not sure about the shelf life because they usually don’t last more than 2 days in my home. I am planning on baking these later this week, really excited! If I bake them on Friday or Saturday and freeze/refrigerate them, would they hold up for Monday? Thanks!! Hi Kate! If you refrigerate them they will hold up for Monday. I usually keep them in an airtight container on the counter. You can also add 1/8 of a teaspoon of ground ginger to help with freshness. But wait to make the frosting until Monday. I hope you enjoy them! Hi Seeta! You could try mashed bananas. I have not tired the recipe with bananas but it should give a similar result. hi, I was looking through the ingredients and I have everything except the applesauce. what can I use instead? Hi Beyza! You could substitute mashed bananas instead of the applesauce. I have not tried the recipe with the bananas, but it should give the cupcakes the same moisture that the applesauce would have. Thanks for the lovely recipe. I followed your instructions throughout and the cupcakes were light and moist. However, I only made 12 cupcakes after filling the paper cups to the top. I also thought that 1 cup of cocoa would be too much. Thus, the cupcakes were bitter for my taste. I’ll definitely reduce the cocoa by 1/2 or more. You are so welcome Bronwyn, I love sharing what I make for my family! I am so glad that you found them to be light and moist. It’s definitely a goal of mine with gluten-free and Paleo baking. Thank you for the wonderful recipe rating. I’m always looking for healthier dessert recipes and this one is a winner! I especially love the frosting, the avocado makes it super creamy. Thank you Joanie! It’s amazing how creamy the avocado chocolate frosting is! My kids loved it. These are absolutely amazing and save the sanity for those of eating gluten-free! Love them! 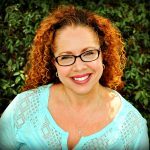 Thank you Marjory! Everyone deserves to eat a good chocolate cupcake. Thank you so much for the wonderful recipe rating. hi Audrey, i was just wondering – would it be possible to bake them also without cocoa powder? and as a replacement for cocoa, use both coconut and almond flour? what do you think and suggest? :) thank you in advance! Hi Kristina! I’m not sure what you could substitute for the cocoa powder. Do you not want them to be chocolate cupcakes? Are you looking to make a vanilla Paleo cupcake? These cupcakes are great- I made them a few months ago and decided to try them out again today. Only thing I want to share with you is that the ingredient list calls for vanilla extract for the actual cupcakes, but then the instruction do not state when to add vanilla extract- so I’ve forgotten to add that both times now! I don’t think its a big deal, they were great the first time. But just wanted to let you know. Thanks! Hi Kate! Thank you so much for letting me know about the missing step in the recipe instructions. It’s fixed. I am so happy that you have enjoyed the cupcakes! Hi Shaynee! Yes if you were to half the recipe just half all of the ingredients. I hope you enjoy the cupcakes! Thanks so much for recipe. I was just wondering if I can freeze the cupcakes ? Hi Laura! I have never tried to freeze the cupcakes (they never last that long in my house). If you try freezing them can you please let me know how they turn out? You are so welcome I love sharing what I make for my family!